A neglected commercial building with a slow known leak—address water damage as soon as possible to manage your risk and reduce your cost. While water is an essential for everyday life, it can be incredibly destructive. This is especially true for those affected by the misfortune of water damage in a home or commercial property. KIC Restoration specializes in San Diego water damage restoration and uses the newest technology to produce quality results in a timely manner. Each project is different – that is one of the most challenging and at the same time rewarding aspects of our business. Regardless of the challenge, we have probably experienced something similar and we remain well equipped to handle those unique requirements in stride. We certainly have the five star reviews to prove it. We do not employ a call center approach; your calls are not routed to an inexperienced “customer services representative” that knows little to nothing about water restoration. Alternatively, we have experienced estimators assigned on the KIC Restoration main line 24/7 – these folks are equipped to provide meaningful answers on the spot Moreover, the same estimator that took your call is likely to be the first responder on site at your property—now that is refreshing. Water damage can have a range of causes and each case is unique. Fortunately, the experts at KIC Restoration remain well equipped to restore your property – from deconstruction to reconstruction, consider it done. One aspect that makes KIC Restoration unique is the caliber of our mitigation staff. The KIC Restoration first responders are nearly all tradesmen – therefore, the tradesmen that are temp setting your kitchen countertop and deconstructing your cabinets are the same tradesmen that will be putting your cabinet back together in a week. The benefits of this approach are enormous! Employing skilled tradesmen to spearhead demolition activities is unique to KIC Restoration and this approach positively impacts both cost and time and is the reason why KIC Restoration is held in such high regard by insurance carriers. 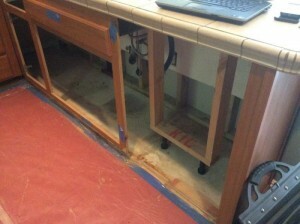 Temp support countertop during a water damage project. Due to the high number of potential causes and the variety of damages that can result, the process of water damage cleanup can be complicated. 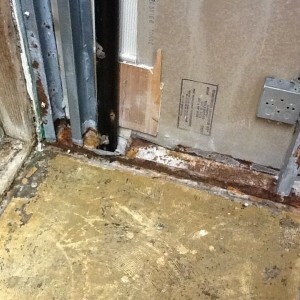 Mold can appear, so sometimes it’s necessary to account for mold remediation services, as well. Some contractors take advantage of this by employing a confusing fee system. You can trust KIC Restoration because our pricing guidelines are standardized. Although the cost of water damage cleanup may vary from case to case, KIC Restoration’s pricing system is straightforward and guarantees every customer a fair price. Our price-estimators are certified Level 3 Xactimate professionals, which means they follow a standardized process of assessing the cost of every job. In a consumer driven market, the experts at KIC Restoration do all they can to provide quality water damage repair San Diego at a fair price. That is why the company works closely with third party labs if any testing is required, such as when water damage leads to a mold outbreak. The use of third party labs prevents the financial interest of KIC Restoration from having an influence on the treatment strategy. Most contractors will perform their own non-standardized assessment in which their ultimate goal is to charge the customer as much as possible. However, KIC Restoration knows that good customer service is the best competitive advantage in the water damage restoration industry. For inquiries about water damage restoration in San Diego County CA, contact the 24/7 support line at (858) 859-1998.